This slot game made by Novomatic is a magical online slot game filled with wizards and dragons and big wins. Anyone who’s into fantasy will enjoy playing this game as will any fans of Terry Pratchett! When you load up this slot, you’ll enter a Wizard’s laboratory where you’ll see him and all of his potions and spells bubbling on the reels, along with his trusty raven sidekick, his wizard’s ring and his book of spells open and ready for his magical experiments! Wizard is the perfect balance between old and new with its classic slot features mixed with the unique and magical theme. There are Wilds and Scatter and Free Spins to be won and the sound effects and music all come together to add to the feel of all the wizardry going on. Fans of other Novomatic slot games, such as: Book of Ra Deluxe and Knight’s Quest, will love this slot and all it has to offer. While we can only guess at all of the strange and unworldly symbols there are hidden in the pages of the Wizard’s spell book, we can tell you all of the symbols in Wizard slot game and what they all mean – they mean payouts! Some pay more than others and, in Wizard, the lower-paying symbols are the card value symbols: Jack, Queen, King and Ace, all of which have been designed in a magical font to fit this slot’s theme! 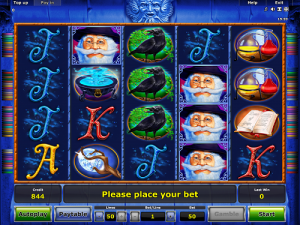 The higher-paying symbols in this slot game are: a bubbling blue potion; two flasks filled with red and yellow liquids; a black crow holding a golden ring in its beak; a book of magical spells; a golden ring set with a red ruby and the top of the Wizard’s magical staff. Symbols will pay out when they fall on a payline, in consecutive reels starting from the leftmost reel. Check the paytable for information on payouts according to your current bet, which can be increased or decreased using the +/- symbols at the bottom of the screen. There are 50 paylines and the minimum bet per line is 0.01 so if you want to bet on all 50 lines, the minimum bet per spin is 0.50 but you can alter either of these amounts to suit your needs. In Wizard slot game, the Wizard himself is magical and powerful as he is the Wild symbol and with his special powers he can substitute for any other symbol on the reels! There is also another magical symbol on the reels and this is the fiery red dragon! This mythical creature is the Scatter symbol and it pays wherever it lands on the reels, payline or otherwise! Whenever you spin three or more red dragons, not only will you get a payout but you’ll also trigger 16 Free Spins! Before the Free Spins start, extra Scatter symbols are added to reels, making it ever more likely that you’ll win even more Free Spins to enjoy and be rewarded by. Aside from these two special symbols and features, there are also a couple of standard features in Wizard which Novomatic fans will know well and these are the autoplay and gamble features. When autoplay is on, the reels spin automatically so you can play the game without having to click a single thing. The gamble feature turns up the heat and allows you the chance to multiply your wins! If you’re feeling lucky, give it a go: red or black – only you will know (and so will, perhaps, the Wizard). On top of Wizard slot game, there’s plenty more Novomatic magic for you to enjoy here at NovomaticCasino.co.uk. We have all of their slot and video slot games which you can enjoy for free, including Novomatic’s most popular games: Book of Ra Deluxe, Lucky Lady’s Charm Deluxe and Red Lady. What’s more, Novomatic’s table games and live casino games are extremely high-quality and offer incredibly high RTP (return to player percentages). If you’re a fan of Poker, Roulette, Blackjack or Baccarat, try out Novomatic’s games and you will never look back.